Doubt is the beginning stage of all Fear. Just a Little uncertainty begins the process of Doubt. Do you have doubt that you will succeed ? Do you expect everything you are working on to collapse instead of Thrive ? Do you listen to people who say it cannot be done ? If this is true for you and you want to breakthrough it then make sure your own internal hard wiring. Shift your attention from Doubt to certainty. What can you be certain about ? If you have doubt then you know, for certain that you can Doubt, and you may be really good at it. 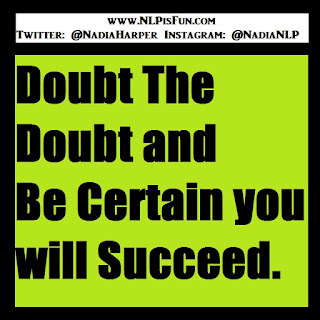 So Doubt the Doubt and be certain you will succeed. Program your mind with your own reality and load up on Positive life affirming suggestions that feel amazing and begin to see yourself as capable to succeed. You must feel capable and be able to engage all sensory experience before you will unconsciously congruently begin the process. Program your unconscious mind for success and you will begin to notice new results in every area of your life.